The simplicity of the fixed gear bicycle’s design makes for a very beautiful bicycle. The clean lines and styling made possible by eliminating the mechanisms required to change to higher or lower gears leave a simple yet beautiful machine. A bicycle with just a single gear. However, not all single gear bikes are fixies, which makes it possible to mistake a single gear bike for a fixed gear bike. To determine whether a single gear bike is a fixie requires taking a closer look. The place to look is at the frame, particularly at where the rear wheel attaches to the frame. A fixie frame is different from a normal road bike frame. 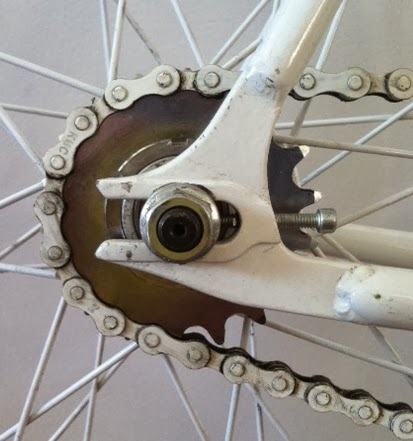 The difference is in the rear dropouts (the slots that the rear axle slips into when putting on the rear wheel). On a normal bike they will point down and forward, but on a fixie frame they will point straight back. The frames are built this way because moving the wheel backwards is how you increase the tension of the chain on a fixie. This can’t be done if the axle is pushed right into its bolting position on a downward facing dropout.